The Asset Map is used to manage the assets that comprise your website, including sites, pages, files and users. Each asset that has been added into the system is displayed in the Asset Map. It also shows the hierarchy of the different assets within Squiz Matrix and is located on the left hand side of the Administration Interface, as shown in the figure below. The Asset Map allows you to navigate your way through a Site and allows you to view the Status of each asset as well as access the editing screens for each asset. The Asset Map also allows you to add, delete, move, clone and link assets. For more information on adding, deleting, moving, cloning and linking assets, refer to the relevant chapters in this manual. 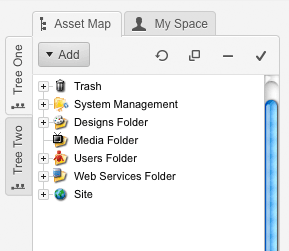 By default, the top-level assets are displayed in the Asset Map, as shown in the figure to the right. System Administrators can decide to change this default view and only show a certain section of the system. 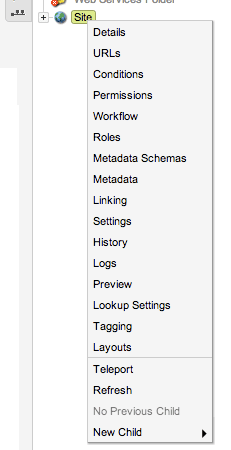 For example, a System Administrator can change the Asset Map to only show a Site when you log in. 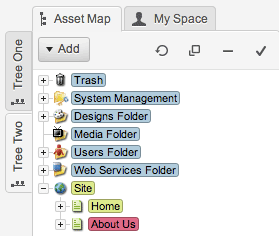 To find out what type an asset is, hover the mouse over the name of the asset in the Asset Map. A pop-up will appear, as shown in the figure to the right. The asset type along with the asset ID will appear. Every asset in the system has its own unique number known as an asset ID. When an asset is created in the system, it will automatically be assigned an asset ID by Squiz Matrix. To find out what is the ID of an asset, hover the mouse over the name of the asset in the Asset Map. A pop-up will appear, as shown in the figure above. The asset ID along with the asset type will appear. At the top of the Asset Map, there are several standard assets that are created when Squiz Matrix is installed. These are standard system assets and cannot be deleted from your system. The Trash contains the assets that have been deleted from the system. You can restore any of the assets in the Trash by moving them back to the required location. For more information on how to move an asset, refer to the Moving an Asset chapter in this manual. 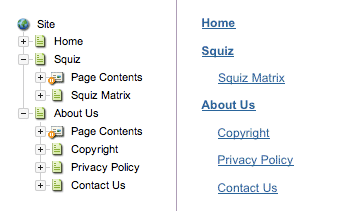 The System Management folder contains several tools for managing your Squiz Matrix system. Only System Administrators and the Root User can access this directory. The Users Folder can be used to store the user accounts that are created for the system. By default, this folder contains the Public User asset. 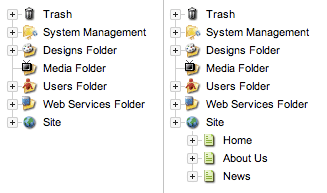 You can only store User, Backend User, System Administrator, User Group and Role assets in this folder. 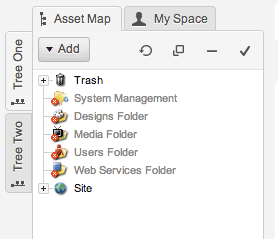 By default, the assets in the Asset Map are collapsed to show the top-level assets, as shown in figure to the right. If an asset has child assets, a expand icon will be shown on the left hand side of the asset icon. For example, in the figure to the right, the Site has child assets as it has a expand/collapse icon but the Media Folder does not have child assets as it does not have one. To view the child assets, click on the expand/collapse icon – the asset will expand to show its child and dependant assets. For example, when the expand/collapse icon for the Site is clicked, it is expanded to show the Home, About Us and News pages, as shown in the figure to the right. To close or collapse the asset, click on the expand/collapse icon again. To expand and collapse the assets in the Asset Map, you can also double click on the name of the asset. For example, to expand the Site in the figure above, double click on the name Site. To collapse the Site, double click on the asset name again. The assets that you can and cannot view or edit will depend on the level of access you have been granted. If you cannot access an asset to view it, a red cross will appear on the asset icon. For example, in the figure to the left, this user only has access to the Trash and Site asset. They do not have access to the other assets marked with red crosses. To access the editing screens for any of the other assets, right click on the name of the asset. The asset menu will appear, as shown in the figure to the right. When you select one of the menu options, the screen for that asset will appear on the right hand side of the Administration Interface. For example, if you select Details from the asset menu of the Site, the Details screen will appear on the right hand side of the screen. The options available in the asset menu will differ depending on the type of asset you are viewing. For an explanation of the common asset screens available in the asset menu,refer to the Asset Screens manual. Three additional options are also available in the asset menu: Teleport, Refresh and New Child. For more information on the Teleport and Refresh options, refer to the Teleporting an Asset and Refreshing the Asset Map sections in this chapter. For more information on the New Child option, refer to the Adding an Asset chapter in this manual. The Asset Map does not communicate with the editing screen until you select an option in the asset menu. If you click on the name of the asset the editing screen will not update until you right click and select an option, for example Details. Therefore, the asset you have selected in the Asset Map may not be the asset you are viewing in the editing screen. To find out which asset current displayed in the editing screen, refer to the information in the screen's info bar. By default, when you first log in to Squiz Matrix, you will see all of the assets in the Asset Map. If you are only working in one particular part of the system, for example your Site, you can teleport that section. This will mean that you will only see that section and its child assets in the Asset Map. You can then work within that section and not have to worry about the other assets in the system. To teleport an asset, right click on the name of the asset and select Teleport. The Asset Map will change to only show that asset and its children and dependants. For example, the figure to the right shows that a Site has been teleported. To return back to the original view click on the Restore the root folder button in the top right hand corner of the Asset Map. While you are using Squiz Matrix, to see the latest assets that have been added to your system by other users, you need to refresh the Asset Map. 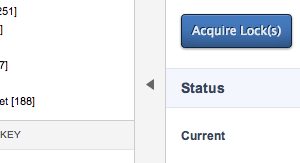 For example, if a another user added an asset to a Site, you will not see it in the Asset Map until you refresh it. If you want to refresh all of the assets in the Asset Map, click on the Refresh all assets button in the top right hand corner of the Asset Map. 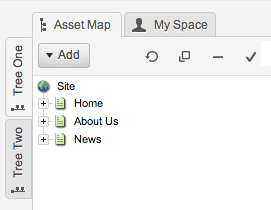 To refresh a certain section of the Asset Map, right click on the name of the asset and select Refresh. For example, to refresh the Site in the figure above, right click on the name Site and select Refresh. At the top of the Asset Map, there are four buttons that allow you to control the Asset Map. These buttons are shown in the figure to the right. The Refresh all assets button allows you to refresh the contents of the Asset Map. The Asset Map will be updated, showing any assets that have been added by another user or remove any asset that has been deleted. The Restore the root folder button allows you to restore the view of the Asset Map if you have teleported a particular section. For example, if you have teleported a Site, you will only see the Site and its child assets in the Asset Map. To go back to the original view, click on the button - the Standard System Assets along with any other Sites you may have in the system will reappear. For more information on how to teleport an asset, refer to the Teleporting an Asset section in this chapter. The Collapse All button allows you to collapse all of the expanded assets in the Asset Map and return back to the original view. 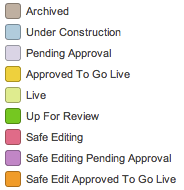 The Show Status Colours button allows you to view the current Status of each asset in the Asset Map. When you click the button the name of the asset will be highlighted with the colour reflecting its current status, as shown in the figure to the right. Click on the button to switch this option off. If you are not sure which colours indicate which Statuses, click on the up black arrow located at the bottom of the Asset Map. A legend of Statuses will appear as shown in the figure to the left. To hide the legend, click on the down black arrow. 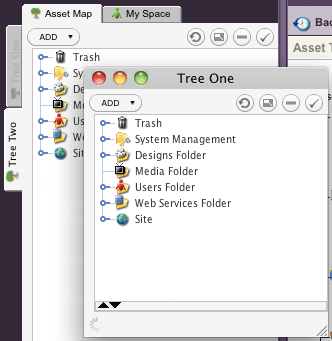 Within the Asset Map there are two different Asset Tree views that you can use. These views allow you to navigate to different parts of your system within the Asset Map. These two views are available by clicking on either the Tree One or Tree Two tab on the side of the Asset Map, as shown in the figure to the left. You can open one section of your Site in one tab, and a different one in the other. You can also teleport to a section of your Site on one tab and teleport to a different section of your Site in the other tab. For more information on how to teleport, refer to the Teleporting an Asset section in this chapter. You can also open the Asset Map in a new window by double clicking on either Tree One or Tree Two. 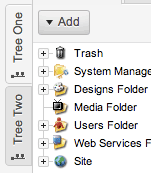 When you do this, that tree tab in the Asset Map is greyed out and cannot be used within the Administration Interface. The figure to the right shows Tree One open in a new window. When you navigate to one of the editing screens for an asset in the Asset Map, it will still open in the editing section of the Administration Interface. To return the Asset Map back into the Administration Interface, close the window by clicking on the X button in the top right hand corner of the window. By default, the Asset Map will be set at a width of 275 pixels. This default width can be altered by clicking to the right of the Asset Map and dragging across to either decrease or increase its size. Dragging the Asset Map completely to the left of the screen will collapse and hide it. This resized Asset Map width will be stored in your browser's local storage and will be retained the next time you log into your Squiz Matrix system. The minimum width of the Asset Map is determined by the system's Asset Map Width setting in your system's Global Preferences. For more information, refer to the Global Preferences chapter in the System Configuration manual. You can hide the Asset Map when you are editing an asset to create more space in the editing interface. This is especially useful if you are working on a small monitor and space is limited. To hide the Asset Map click on the white arrow in the middle of the Asset Map, as shown in the figure to the right. To show the Asset Map again, click on the white arrow. If there is a large number of child assets in the Asset Map, arrows will appear to allow you to navigate through the list, as shown in the figure to the right. These arrows help increase the speed of the Asset Map when it is loading the assets. By default, the number of assets shown is set to 50 assets. If an asset has more than 50 child assets, the arrows will appear in the Asset Map. System Administrators and the Root User can change this setting. For example, in the Asset Map shown in the figure to the right, the Asset Map has been set to only show 3 assets at a time. To move to the next section of assets, double click on the small green down arrow . For example, when the small green down arrow was double clicked in the Asset Map in figure to the right, the next set of three assets are shown in the Asset Map. To move to the last set of assets, double click on the large green down arrow . Once you have moved down the list of assets, green up arrows will appear in the Asset Map, as shown in figure to the right. Double click on the small green up arrow to move back up one set of assets or double click on the large green up arrow to move back to the first set of assets. The navigation menu within a Site is a direct reflection of the Asset Map, as shown in the figure below. The Asset Map for the Site is shown in the figure on the left and the navigation menu within the Site is shown in the figure on the right. Because of this, the order of the assets in the Asset Map is important. For example, if you wanted to create a page called Your Feedback and have it appear as the first page under the About Us page, you would need to create it before the Copyright page. If you added the page after the Contact Us page, that is where the Your Feedback page would appear in the navigation menu of the Site. By default, when you create an asset, it will appear in the navigation menu of the Site. You can choose to hide an asset from the navigation by changing its link type. For example, if you do not want to show the Contact Us page in the navigation menu, you can change its link type. For more information on how to add, move and hide assets, refer to the relevant chapters in this manual. There are a number of shortcuts that are available in the Asset Map. These are listed in the table below.